When I find a recipe that I might want to make one day—but not necessarily today—I copy the URL to a file. Looking at this list may tell me what I have been unconsciously searching for—today it was lentil soup. Five of the 20 URLs I copied were for some form of lentil soup, one with sausage. I thought, “I have lentils. I have sausage. Let’s make that!” Since the sausage was chicken Italian, a soffritto of onions, celery, carrot, and tomato seemed like a good base. I wanted a green vegetable, so I thought some fresh spinach added at the very end would be a good idea. Finally, half an hour before dinner, Eilene informed me that one of her friends would be joining us. A quick can of garbanzo beans would be just the way to stretch the soup. This would be a balanced, hearty meal soup. 1. Cut tomato in half and put the halves, cut side down, under a broiler for 5 minutes. Tip: If I have a handy pot of boiling something on hand, I toss the tomato in to blanch and make the skin easy to remove. However, boiling a pot of water, just to peel one tomato, is energy wasteful. Broiling does the same thing with less energy. 2. Let the tomato cool. Peel, seed, and chop the tomato into small bits. Tip: Put a sieve over a bowl to catch the seeds. Press the tomato jelly through the sieve and then add the tomatoes to the bowl for later. 3. Add the butter or oil to a large soup pot and brown the sausages well. 4. Set the sausages aside to cool and then cut them into half inch slices. 5. Add the onions, celery, carrots, and salt to the pot. Sauté for five minutes. Tip: Use the moisture released by the vegetables to de-glaze the pot—releasing the browned bits left by the chicken sausage. 6. Add the carrot and sauté for two more minutes. 7. Pull the vegetables to the sides of the pot and add the garlic and tomato paste to the hole in the center. 8. Sauté until the garlic is fragrant and the tomato paste has darkened, about two minutes. 9. Stir in the chopped tomatoes. 10. Add the broth and bring the pot to a boil. 11. 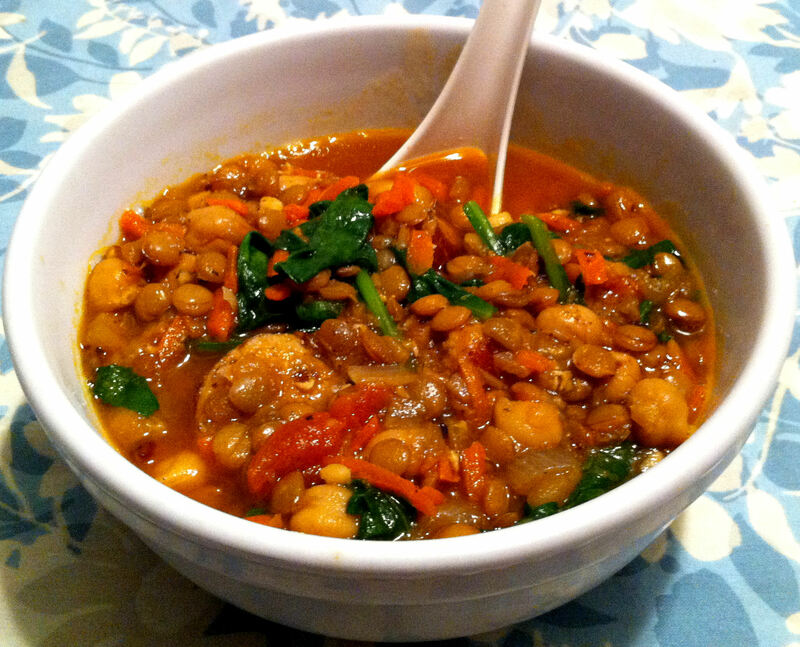 Stir in the lentils and garbanzo beans, cover the pot, and reduce the heat to a simmer. 12. Continue cooking the soup for 20 minutes and then add the sausage and pepper. Tip: For a heartier broth, mash some of the lentils against the side of the pot to release their starch. 13. Simmer for five minutes more and then stir in the fresh spinach. Tip: The spinach will quickly become over done so do not wait too long to consume. If you need to wait for dinner, do not add the spinach until just before serving. 14. Check the seasoning and cook for 2-3 minutes more. After all of these years of cooking I just discovered how good lentils can be…your recipe sounds fabulous, thank you for sharing. I totally love the look of that soup. I wish I could dip some naan in it and slurp away!!! thanks for sharing!